Metroidvania games have always had a hint of the queer about them, although it has faded with time. The protagonist of the archetypical Castlevania, Symphony of the Night, is Alucard, a ringletted dandy with half-vampiric sensuality. Link, the protagonist of the similarly-designed Legend of Zelda series, is an often-feminine “elf” or “fairy” boy. In its time, Metroid was considered most transgressive in presenting a battlesuited protagonist, Samus, who is revealed to be a woman at the end of the game in an only mildly-titillating swimsuit shot. In her armor, in this game, she is androgynous, and the original American manual refers to her as “he.” As the knowledge of her gender became wider-spread, her official art becomes more and more feminine in each game: thinner-waisted, bustier, wider-hipped. By Super Smash Bros. Wii U, her Zero Suit form is a skintight catsuit with high-heeled boots. Popularity and familiarity forced her to conform to gender expectations. Early in Hot Tin Roof, a character misgenders the protagonist, Emma Jones, who assures them that both she and her partner Franky (a cat) are women. Those names: Jones and Franky. Masculine names for two woman cops in fedoras, hats so stereotypically masculine that they’ve become the subject of ridicule in modern culture. Jones isn’t questioned or mocked for being a policewoman, but her partner gets ridicule for being a cat — even in a world of talking cats and birds. Jones also isn’t straight; she has a shaky noir romance with Suzy, who runs the local diner. But the subversion in the game isn’t limited to gender presentation. These sorts of games are typically violent. The template of a Metroidvania has you acquiring equipment and skills that make you more effective at combat while also helping you explore and traverse the area. Hot Tin Roof eliminates the first part. The bullets for your revolver are all nonlethal, only used for opening doors and helping you be more mobile. You receive rubber bullets, bubble ammo, grapple ammo… your most destructive item is a gumdrop round, which explodes when lit. It’s only used to blast open doors. Most of the ammo is presented as toys or novelties, not weaponry. This isn’t a nonviolent game, though. While you’re not hurting anyone, others are. The crimes you’re investigating include a cold-blooded murder and a coverup by a company secretly making weapons. The world is full of organized crime and oppression of the sapient animals by the humans and the wealthy. You serve as a force of anti-violence, a “good cop” in contrast to the increasingly visible police violence in the real world during the game’s development. Metroidvanias are not known for their depth of plot. “Find and kill the boss or bosses” is a close enough summary for most of the well-known classics. Metroid is about killing Mother Brain to stop Metroid experimentation. Symphony is about killing Dracula to stop his spread of evil. Zelda is about killing Ganon to rescue the helpless, eponymous princess. These games are about a material evil that can be eradicated through the application of violence. The ethical themes explored by Hot Tin Roof, though, have a decidedly feminist bent. One suspect is motivated by resentment against her mother, who abandoned her as a child. Meanwhile, she herself was saved from being spayed against her will by a veterinary student. The animals in the game have an implicit class structure based on species of birth: humans, cats, birds, rats. A cat is thrown onto the street for peeing in shoes. A company that is supposed to produce food produces weapons instead. Your investigation is complicated by the exclusivity of a fancy apartment building. Maternal responsibility, reproductive rights, the military-industrial complex, shaming of natural processes, class oppression: feminist themes through and through. You’re not pursuing conquest; you’re pursuing justice. Hot Tin Roof is subversive. It takes a well-loved structure and twists its assumptions. The police detectives are butch women, at least one of whom isn’t straight. The primary mode of interaction in most Metroidvanias, violence, is stripped out, leaving exploration and (shockingly) conversation. The ethics are complex and focused around relationships and oppression rather than assassination. Games often promote themselves as “X genre with a twist,” but Hot Tin Roof provides more than just a twist. It subverts and queers long-held assumptions of its genre and comes out feeling original, refreshing, and earnest. 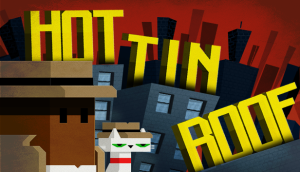 Hot Tin Roof: The Cat That Wore A Fedora was created by Glass Bottom Games with design by Megan Fox. I was a Kickstarter backer. I’m a co-founder of Future Proof Games. We’ve released Ossuary, a funny trip through Discordian Hell currently on Steam Greenlight. We’re currently working on Exploit: Zero Day, a browser-based HTML5 puzzle game in closed Alpha about hacking, roleplaying, and sticking it to the Man.